With the recent move, I needed to look for the closest market(s) to me where I can do my regular fruits and vegetable shopping. One of them being the Breteuil-Saxe market that’s held every Thursday and Saturday, at the tip of the (imaginary) axes where Champ de Mars and Les Invalides meet in southward direction. 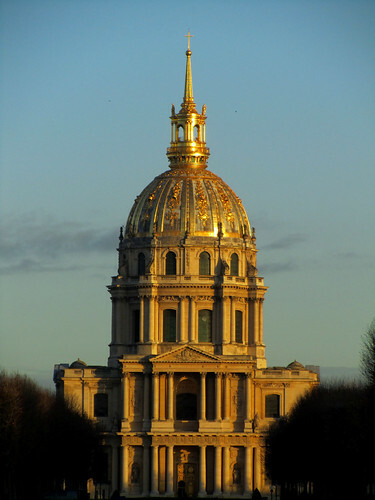 It does mean the setting is simply idyllic on a morning like today, where golden ray bounces of the dome of Les Invalides while on the other hand, one could shop while admiring Eiffel Tower at the same time. If this is not one of the ways to celebrate the fabulous life of a Parisien(ne), I don’t know what else it could be. Especially for one who loves food. And I’m doubly pleased that my vegetable producer from my old regular market also sets up stall at this one. He was certainly surprised to see me here this morning! No way, this is an impossibly surreal shot! thanks jo – it was a morning of perfect lighting. sure it meant i was on my way to the market before 9am but it was worth it!